Wedding planner Zoe Smart is getting a reputation for being a jinx. The worst part is, the rumors may be true. 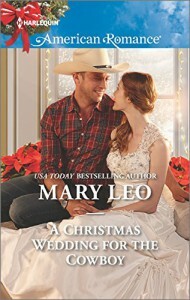 Zoe's last two brides bailed on their grooms, so she really needs cowboy Carson Grant's wedding to go off without a hitch, aside from the one in her heart every time they meet. Though Carson knows he has to tell Zoe the wedding's canceled, he doesn't want to give the town's wagging tongues more fodder. Besides, Carson is having way more fun planning a nonexistent wedding with Zoe than he ever did planning his real one. But time is running out to tell the truth. Will Carson's ruse charm Zoe's romantic spirit, or will their love be jinxed from the start? Good book. Carson is a big time rodeo bronc rider who got badly injured on his most recent ride. After a couple months he's starting to heal, but then his fiancee ends their engagement. He's still dealing with that shock when he meets with wedding planner Zoe. Currently, Carson's is the only wedding that Zoe and her partner are working on. She is battling a run of bad luck that has rumors of her being jinxed running rampant. If she can't pull off this wedding, her business is done for. I liked Carson. Though he knew that he had to tell Zoe that the wedding wasn't going to happen, he couldn't stand to hurt her that way. He decided to go on planning the wedding as though it was still going to happen. What he didn't expect was to start falling for her. I liked the way he became so protective of her, trying to think of ways he could help. The idea he came up with, to have her plan a birthday party for his father to happen later that same day, could have turned out so badly. I loved the confidence that he showed in her ability. The events of the party were hilariously portrayed, giving Carson another idea for what to do about the wedding. I liked Zoe also. She's fighting an uphill battle with her business. First she had to deal with the lack of support from her parents, who wanted her working for their law firm. Then she had to deal with a couple of weddings with no-show participants, a couple more that simply canceled ahead of time, and one previous wedding that is ending in divorce. Suddenly people believe that having Zoe do their wedding means disaster is sure to follow. She really wants and needs Carson's wedding to go smoothly. Something feels a little strange when Carson starts showing up for all the parts the bride usually does, but she accepts his explanation. What has her really worried are the things she's starting to feel for the groom. I really enjoyed the growing relationship between Zoe and Carson. Spending all that time together showed that they had much in common. Carson is still dealing with the effects of his rodeo injuries, which include some guilt over the injuries of the rodeo clown who helped him and wondering if he'll ever be ready to ride again. I liked the way that Zoe seemed to sense his turmoil, and helped him through his first real public appearance after his injuries. The attraction builds between them, but Zoe still believes that he's engaged and refuses to think that he could be a cheater. When the truth comes out, Zoe is furious about the deception, and still reluctant to believe that he is really in love with her. There's a great scene in the bridal gown shop when the ex-fiancee shows up and things get really wild. The ending was fantastic. I loved the way that the wedding was handled, with an unexpected twist regarding the participants. Even better was seeing Carson and Zoe's big moment, perfectly done for them.